Man United drop to second place in Group G following a frustrating 0-0 draw at home to Valencia on Tuesday. Paul Pogba in action at Old Trafford on Tuesday. MANCHESTER UNITED FAILED to relieve the mounting pressure on manager Jose Mourinho with another insipid attacking display in a 0-0 draw at home to Valencia in the Champions League on Tuesday. Already nine points adrift of Premier League leaders Manchester City and Liverpool after three defeats in seven league games, Mourinho was hoping for a reaction from Saturday’s dreadful display in losing 3-1 to West Ham United. Instead, his side again looked devoid of ideas and invention to draw a blank and fall two points behind Group H leaders Juventus with two games against the Italian champions to come. A point does at least consolidate United’s position three points ahead of Valencia in second place, with Swiss champions Young Boys looking like the whipping boys of the group after a second 3-0 defeat in two games, this time against Juventus earlier on Tuesday. Kick-off was delayed by five minutes as United were held up by traffic that meant Mourinho’s men didn’t arrive at the stadium until less than 45 minutes ahead of the planned 8pm (1900GMT) start time. However, it took far longer for the game to come alive after a drab first half that summed up both sides’ struggles so far this season. Mourinho recalled Alexis Sanchez, who hadn’t even made the bench for Saturday’s defeat, among four changes from the weekend. But it was Marcus Rashford on the opposite flank who was United’s biggest threat as the Chilean again disappointed before being replaced 15 minutes from time. Rashford fired wide from the edge of the area and had another long-range effort comfortably handled by Neto early on. In a recurring theme of United’s decline over the past few months, though, there seemed little cohesive attacking plan other than a series of long balls hurled towards Romelu Lukaku. Valencia registered their first win of the Spanish season at the seventh attempt at Real Sociedad on Saturday, but the Spaniards’ struggles to score goals were also obvious despite enjoying plenty of possession. Goncalo Guedes enjoyed most of Valencia’s openings, but the Portuguese has still yet to score since making his loan move from Paris Saint-Germain permanent in August. Guedes fired off target when well-placed on the edge of the area either side of half-time as Valencia started the second half brightly. That prompted chants of “attack, attack, attack” from a disgruntled home faithful. 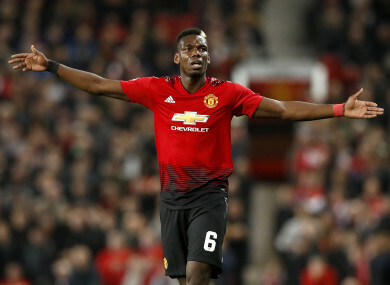 United duly responded as Paul Pogba’s shot was deflected wide before a free-kick from the Frenchman finally forced Neto into his first serious save. Valencia failed to take advantage of Cristiano Ronaldo’s early red card in losing 2-0 to Juventus on matchday one and could yet regret not cashing in with all three points against a misfiring United side. Michy Batshuayi blasted the visitors’ best chance over from close range, before Guedes miscontrolled when clean through on goal. At the other end Neto did well to turn a Lukaku effort behind before Sanchez’s lack of confidence was laid bare when he took a touch too many inside the Valencia box and was crowded out. That was his last involvement as Mourinho’s decision to replace the former Arsenal forward with Anthony Martial was cheered by the United fans. Rashford came closest to breaking the deadlock with a free-kick from a narrow angle that clipped the crossbar, but a winner would have been more than either side deserved. Email “Champions League frustration for Man United as Valencia depart Old Trafford with a point”. Feedback on “Champions League frustration for Man United as Valencia depart Old Trafford with a point”.